As part of its Lives Too Short campaign, the Men’s Health Forum is asking organisations and individuals working with men in any way to sign a new Pledge. The Royal College of Nursing, the Royal Society for Public Health, Coventry City Council and Sustrans are among the first organisations to do so. MHF CEO Peter Baker said: 'We’re delighted that several major organisations have already signed our new men’s health Pledge. Action on these five key issues could make a real difference to men as well as their families and friends and reduce the tragic waste of lives cut short by preventable problems. We want others to show their support by backing the Lives Too Short Pledge. All organisations interested in health and people working with men in any way can sign up to the Lives Too Short Pledge and download the Lives Too Short report and poster. 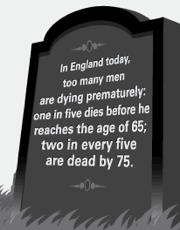 More news: Why are men's lives too short?